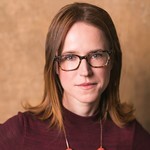 M. Bevin O'Gara is the Associate Producer at the Huntington Theatre Company and directed The Who & the What, Kirsten Greenidge's Milk Like Sugar (Elliot Norton Award nomination for Best Production) and Melinda Lopez's Becoming Cuba. Other directing credits include appropriate, A Future Perfect, Tribes (Elliot Norton and IRNE Awards for Best Production), and Clybourne Park (SpeakEasy Stage Company), Brahman/i, Chronicles of Kalki; You for Me for You; Love Person; and The Pain and the Itch (Company One Theatre), Phedre (Actors’ Shakespeare Project), Fast Company (Lyric Stage Company), Marjorie Prime (Nora Theatre Company), How Soft the Lining and Translations (Bad Habit Productions), Matt and Ben (Central Square Theater), Two Wives in India and Gary (Boston Playwrights’ Theatre), 2.5 Minute Ride (New Repertory Theatre), Melancholy Play (Holland Productions), Tattoo Girl, Painting You, and Artifacts (Williamstown Theatre Festival Workshop), and ANTI-KISS (3 Monkeys Theatrical Productions). She is the recipient of the Lois Roach Award for Outstanding Commitment to the Boston Theatre Community from Company One Theatre. She has a BFA from Boston University in theatre studies. This summer she will be moving to Ithaca, New York to become the Producing Artistic Director of the Kitchen Theatre Company. mbevinogara.com.